SMS marketing is one of the most cost effective ways to attract new customers to your business and grow your revenue. With Voodoo SMS, you can send and receive bulk text messages using our online interface, making it easy for you to market your business using SMS. Our platform is built with small and large SMS marketing campaigns in mind. You can send your promotional text messages as instant broadcasts to raise awareness of your brand and offer, or as scheduled broadcasts to generate a steady flow of inbound leads for your sales team. Thanks to our great bulk pricing, you'll pay less and less for each SMS you send as the scale of your campaign grows. With Voodoo SMS, you can launch a profitable SMS marketing campaign from just 1.74p per message. 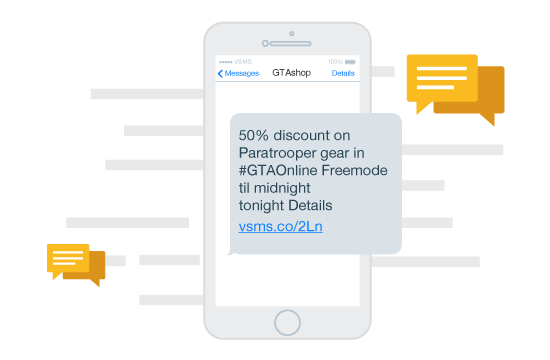 Do you know that SMS marketing messages have a 97% open rate? That's more than 10 times as high as the average email marketing campaign? Or that the average SMS advert is opened in six minutes or less by the recipient? The cost of SMS marketing has never been lower, and with huge benefits that aren't offered by email marketing or direct mail, there's never been a better time for your business to spread its message using SMS. We're one of the UK's top SMS marketing providers, with a user friendly system that lets you send SMS messages in bulk. Read on to learn more about how SMS marketing with Voodoo SMS works, and how your business can use SMS to generate more leads, sales and revenue. Our online SMS platform is designed with marketers in mind. We understand the needs of your business and offer a powerful SMS marketing solution that lets you reach your target audience with special offers, alerts and notifications, coupon codes, reminder messages and more. Using Voodoo SMS for your SMS marketing campaign is simple. All you need to do is create a free account and import your contact list. Our platform lets you deliver your marketing message to your entire list at once or schedule your message for batch delivery over a period of time. Once you've prepared your message, fund your account using our flexible funding system and you're ready to start sending. You can send and receive SMS online with Voodoo SMS, making it easy to track our SMS marketing campaign's response rate from our user friendly interface. Launching and optimising your SMS marketing campaign is simple when you use Voodoo SMS. To get started, create your free Voodoo SMS account and import your marketing list. Once your text message is ready, you can schedule your campaign to start immediately with a marketing SMS broadcast to your target audience. Our delivery reports make it easy to stay on top of your SMS marketing campaign's KPIs. At any point in your campaign you can pull up detailed delivery reports with performance metrics such as your campaign's delivery rate, bounce rate and the number of inbound responses. We'll provide detailed information on failed mobile numbers with each report, making it easy for you to remove inactive or incorrect numbers from your list. We also maintain a full archive of all your text messages and their KPIs, making it easy for you to measure performance over time. Our API makes it easy for you to deliver reminder, notification and alert messages to your users from your mobile app. With simple modules for platforms like Magento and OpenCart, our SMS marketing platform is built from the ground up for mobile apps and ecommerce merchants. Our volume-based pricing model means that the more text messages you send, the less you'll pay for each message. Using Voodoo SMS, you can start your SMS marketing campaign from just one message; there's no minimum volume or ongoing contract to worry about. SMS pricing using Voodoo SMS starts from just 1.74p for bulk campaigns, with excellent pricing also available for low-volume SMS marketers. Our SMS credits have no expiry date, letting you fund your account at a bulk rate to get the best value for your SMS marketing campaigns.